De Berkenhof estate is situated on an island completely surrounded by reeds, grassland and the Nieuwkoopse Plassen lakes. This exquisite estate of more than four hectares has a mansion (floor space of some 287 square metres) and an inviting guest house, which could be used as an office or to accommodate staff or a carer. The guest house has 125 around square metres of floor space and is equipped with underfloor heating and its own boiler. On-site there is also a sizeable shed connected to a double garage and studio. In addition you will find an impressive fish pond, ample parking spaces for welcoming your clients, friends and acquaintances, a kennel, a wide open garden, trees, a vegetable plot and, of course, a romantic rose garden. 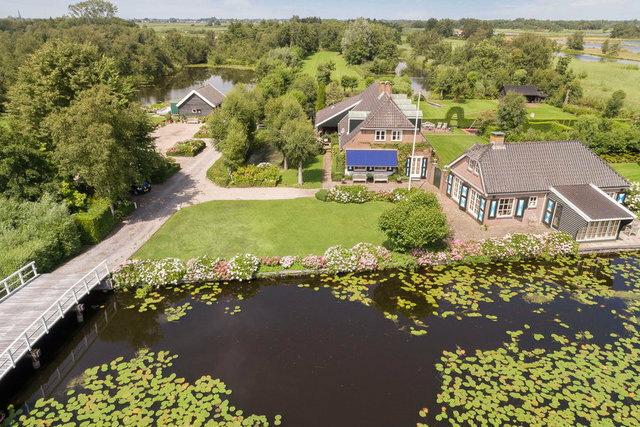 This piece of paradise offers your own private place to swim, a quiet spot to fish for carp, pike or eels, and a jetty more than 14-metres long on the Hollandse Kade, giving you direct access to the Nieuwkoopse Plassen lakes.